Using the latest cheap helicopter discount codes is an amazing way to get great value for your money. Special offerings such as free deliveries, extended warranties, and discounted rates are also up for grabs. You can get them from Amazon, Very, Tesco, and other UK popular retailers. Choose among the different reputable UK retailers on where you can get the best Helicopter deals and bargains. Helicopter voucher codes that can give you as much as 60% savings are offered by various popular UK retailers. These are great toy items for your children. 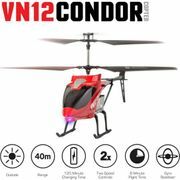 Flying Gadgets K10 Helicopter - Red - 25% Off! RC Helicopter 3.5 Channels - HALF PRICE! 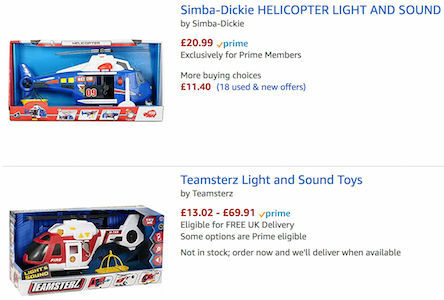 The best toy helicopter deals and special offers in the UK! There are many types of toy helicopters. They are also called radio-controlled helicopters or RC helicopters. It is a model aircraft that is distinct from an RC place because of the various differences in aerodynamics, flight training, and construction. There are several basic designs of radio-controlled helicopters and most models have collective pitch control. These models are maneuverable but harder to control. These units are for advanced users. RC Helicopters have flight controls to allow the pilots to control the throttle and tail rotor. Controlling these effectively will enable the helicopter to perform maneuvers just like full-sized helicopters. It can hover and fly backward flight. It can even make some other maneuvers that full-sized helicopters cannot like flying inverted. Newer RC Helicopter models have gyro-stabilization to make it more dynamic. The older engines usually use methanol-powered two-stroke motors. Today, engines use electric brushless motors that are combined with high-performance lithium polymer battery. These are now common because they provide improved lifespan, efficiency, and performance. This also decreases the prices of RC helicopters making them more affordable for hobbyists. For some helicopters, jet turbine engines and gasoline are also used. Flying and operating RC helicopters is a fun activity. If you are a hobbyist you should purchase large toy helicopters. There is a wide range of brands and models that you can choose from depending on your preference. Different helicopter models come in various price ranges because of their performance, durability, and flying efficiently. Here at Latest Deals, we will provide you with necessary information about the best cheap helicopter deals, offers, and discount codes. Basically, all you have to do is to use the voucher codes upon checkout to get discounts up to 50% on selected helicopter models. There are even 3 for 2 offers that can provide you with a lot of savings as well. Get big discounts from Argos, Debenhams, and The Entertainer. There is toy helicopter with lights and sounds that are more costly but very entertaining to operate. Children and teens are fond of flying these types of toys. Whenever children play with these products, make sure to supervise them because toy helicopters have small parts. Nonetheless, most of the components of these toys are secured and are safe to play with. If you are looking for a toy helicopter for adults or kids, then you came to the right place. Our community of bargain hunters have gathered the best cheap helicopter voucher codes that will allow you to get big discounts. There are even voucher codes that allow you to have your orders delivered to your home for free. 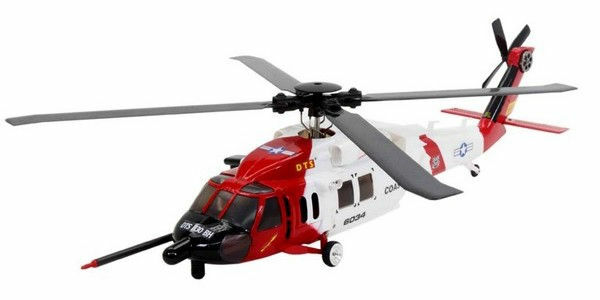 There are also helicopter toys for toddlers that are very safe to play with. These types of toys are somewhat more expensive than others but it is well worth it because it is very entertaining to play with. You can purchase them from Amazon, Very, Tesco, and other UK retailers. They have some of the best remote control helicopter units available on the internet. If you have money to spend then you should buy a more high-end unit that is more dynamic and have great flying efficiency. Watch out for their Black Friday, Cyber Monday, and Boxing Day deals where their prices are reduced even further. E-flite Blade mCX2 RTF RC Helicopter. This is the best overall unit available today. It is regarded as the best because of its battery life, quality, and flight control. 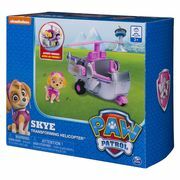 When you purchase this item, you will see that it is already assembled and you can play with it straight from the box. Syma S111G – This one is the best in its price range. It is one of the most affordable remote control helicopters around. It can provide you with longer flight times and it only takes around 30 minutes to charge it completely. It also uses an integrated electric gyroscope system for ease of use. 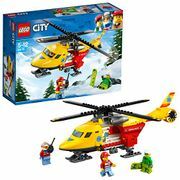 BLH4100 120 S. It is a six-channel helicopter that is great for experienced "pilots. It has an experienced mode which allows you to turn off the pitch and roll that allows to fully gain control of the helicopter. Blade 230s BNF. This has great for doing acrobatics since it can flip over easily. It can also do inverted flying. It can easily do stunts such as loops and rolls. It is great for intermediate to expert hobbyists looking for a more challenging unit to fly. Haktoys HAK303. This particular model is best for kids ages eight and above. It offers great flight stability and control. It has a built-in gyroscope boosts in-flight stability to allow children to fly it more efficiently. It also has an adjustable speed control to allow parents to adjust the velocity to a minimum. Syma S107G. This is one of the most popular models for beginners. It uses three-channel controls that allow early users to maneuver it easily. Beginners learn the steerage basics helping them to improve their flying technique. It is very lightweight and will not damage easily. GPToys G610. This is best used indoors and it is good for children and teens. It has easy controls and great handling. It can fly all over your indoor area and it also looks beautiful most especially in slightly dark areas because of its multicolored LED lights.